I am a fresher with engineering background so I thought the prestigious IIM Raipur will be a better choice for me. All the IIMs are known for the excellent courses and classroom experiences. 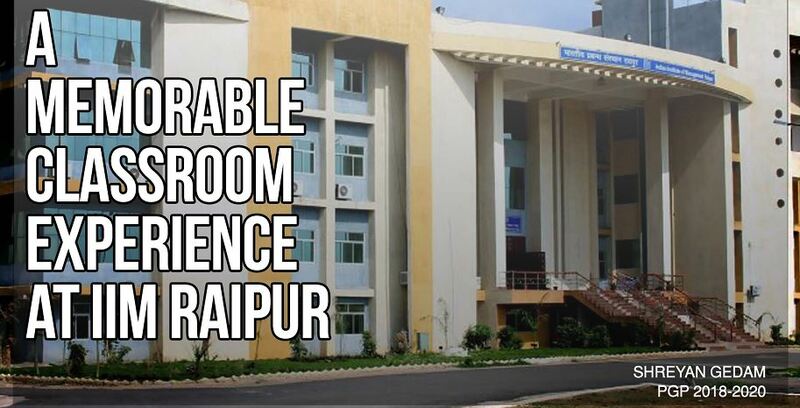 The classroom experience that I experienced in IIM Raipur was phenomenal. There are diverse people from our batch with distinguished occupational backgrounds. You will get to know many people which will, of course, increase your networking and knowledge in different fields. Every topic discussed in the classroom has a different perspective from different people, which helped many of students to have a different thinking approach. As faculty are concerned, they are top notch and experienced in their own fields. Gaining knowledge and current affairs in the industry are blended in our courses. Professors help to clear our doubts and take the problem statement to next level for brainstorming. The Group activities and case studies are good and are the key learning of the curriculum. I aspire to work for Aditya Birla Science and Technology Private Limited. I want to pursue my MBA in Operations and my B.Tech in Electronics Engineering will help me for the techno-manager profile. It will be a great experience to work on innovative projects. I will be able to use my skill sets that can prove to be of benefit to the company. Advanced technology in the near future, innovation and recent technologies will play an important role and be creating a lot of opportunities for the company.